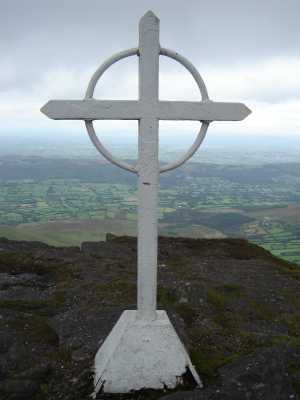 Picture from LiamD2005 : The cross on the top! Picture: The cross on the top! Well seeing as I was driving from cork to Kildare and needed to burn off the few thousand calories I ate the night before, I decided to give Galtymore a go from the Mitchelstown side. I started from the car park that is 3km off the N8 and with 2 bottles of water, a flask of hot tea , a chicken wrap and a bag of Meanies. All of which are obvious survival items. Especially the meanies. I followed the dirt road for about 20 minutes (close the gate), until it branched left and right. I went left which meant going down into the valley and back up towards galtybeg through some very steep boggy ground which prevented it being the easy dawdle I thought it would be. All in all the weather was very clear and the views fantastic. I meant a friendly chap near the top who let me know that beyond the summit was another lake worth seeing. The ground was very muddy on a lot of it and three cheers for the lunatics that left bike tracks near the edge of the cliff.